A chat with Mrs. Zeeba Al Ameer, co-founder, Nasayem Al Bahrain. Little drops of water make the mighty ocean – This saying goes true with the mission taken by Mrs. Zeeba Al Ameer to generate awareness in our society on the importance of plants. “When each home starts having a small garden, it wouldn’t take much time for Bahrain to become lush with greenery like the good old days.” She says. Her consultation process includes visits to the client locations where gardens need to be set, checking soil fertility and suggesting plants to be grown depending on the place. Mrs. Al Ameer believes in providing written reports of her visits to the sites as it becomes easier for her clients to re-check on the points that she had discussed with them. She sometimes refers contractors as per requests from the client but is very strict about the guidelines she has set for the work done by the ones she refers. “It is true that you will require extra support if your garden is big and ground jobs need to be done, but I would always suggest you to work with your family in the garden”. Mrs. Al Ameer had more than just words to share with us on the importance of gardening as a family. “It tightens the bond between the relations and also gives the younger generation a better understanding about living with the nature.” “There used to be a time when men never took interest in planting in their backyard. But times have changed and these days I have more male trainees than females.” She adds with a smile. 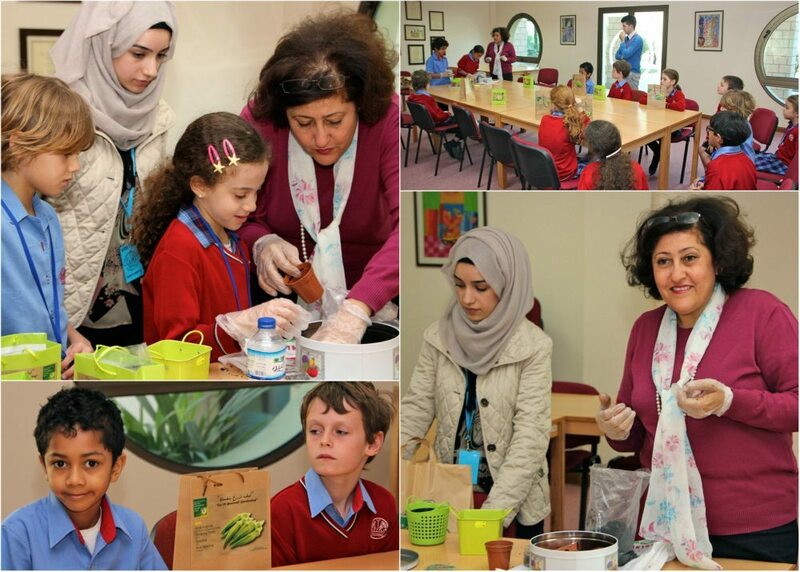 Mrs. Al Ameer also shared with us her happiness to have trained kids of different ages the basics of gardening. She showed us the small kits displayed at Nasayem for the kids that included all the accessories for gardening including seeds, pots and compost. Well-travelled as she is, when you enter Nasayem Al Bahrain at the Riyadat mall, it will be hard to miss the unique garden accessories that adorn the place. “I love traveling and where ever I go I collect special items those are many a times unavailable in Bahrain. All the items you see here are from my collectables.” said Mrs. Al Ameer with great pride, showing us the collections that decorated the shelves and soon will be adding to the beauty of a lucky garden. For years, Mrs. Al Ameer has been a regular face on Bahrain TV with her shows on the tips and tricks of gardening. She is also the regular face at the Bahrain International Garden show and one of the busiest ladies there, giving away free advice to anyone who comes to her with a problem in growing plants. A lady of contributions, she is actively involved in many charitable activities, including creating one of the best award winning gardens for differently abled children free of cost. Even though she complains about being tired with growing age, Mrs. Al Ameer will amaze you with her vibrancy of the young when she is in the world of flora. “Mrs. Al Ameer was all praise about the importance and support, Her Royal Highness, Sheika Sabika bint Ibrahim Al-Khalifa have been giving to the agricultural sector of the kingdom and making Bahrain go green”. Previous articleThe funniest Persian was in BAHRAIN!